Judge Paul Watford, 9th Circuit Court in Pasadena, who was on President Obama’s short list for the Supreme Court. George Bush, 41st president, for the cover of US News & World Report during his run against Michael Dukakis. Ronald Reagan, just after leaving office, appearing to be a tad confused during our session. Peter Drucker, business world guru. John Dionisio, CEO of AECOM for several years, during which the firm grew immensely. Jane Chmielinski, number two at giant AECOM for many years. Mike Burke, current CEO of AECOM. Saul Bass, graphic designer & creator of famous movie titles, such as Psycho, to name but one. 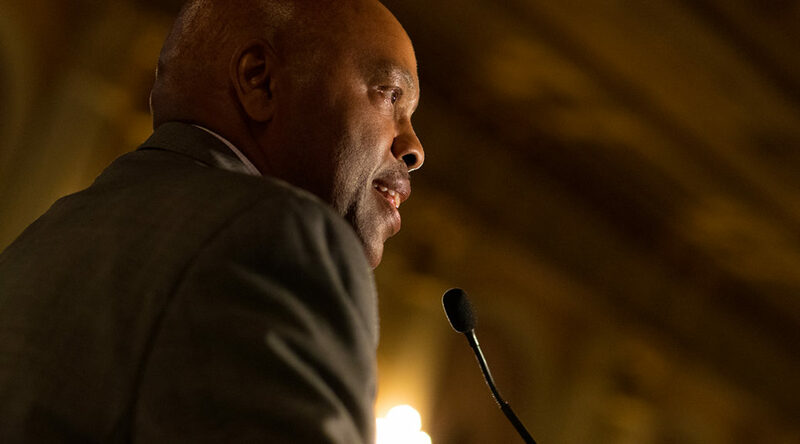 Phil Washington, CEO of LA Metro, speaking for a WTS event at The Biltmore, in Los Angeles. Pat Hitchcock, the only offspring of director Alfred Hitchcock, who benefited from the previous designer, Mr Bass, since he did several of Hitchcock’s most famous titles. Dr C. Noel Bailey Merz, Cedars-Sinai Hospital, who heads up the Women’s Health Center. Ms Stephanie Wiggins, Metro Deputy CEO, photographed at LA’s architectural gem Union Station. David Dornsife, namesake of USC’s Dornsife School. Dr. Steve Kay, formerly dean of USC’s Dornsife School, photographed inside the schools’s Hoose Library of Philosophy. Amber Miller, dean of USC’s Dornsife School. My good friend, Emmy-winning director Jim Stimpson. The Dodgers’ Clayton Kershaw, about to deliver another pitch that is – most likely – not hittable. Edward Ponti, son of Carlo and Sophia Loren, photographed for USC’s Dornsife School. Stephen Wynn, impresario of Las Vegas, photographed for Forbes Magazine during the construction his The Mirage Hotel.